Chávez: Hero, Prophet Or Tyrant? The U.S. this week banned arms sales to Venezuela — just the latest confrontation with a Latin American country that is a huge exporter of oil to the United States. CBS news correspondent Lee Cowan traveled there to explore the roots of the growing strain. Take a walk through the gritty barrios of Caracas Venezuela — and it's hard to imagine that its all sitting on what is estimated to be the largest reserves of crude oil in the world. Venezuela supplies almost as much oil to the U.S. as Saudi Arabia does — gas here is still just 12 cents a gallon. But the disparity between those who benefit from that wealth — and the vast percentage of those who don't — is gut wrenching for American Charlie Hardy. "I lived in a cardboard shack for eight years in Caracas," says Hardy. "I was a Catholic priest. We had no water, no sewage system or anything," he says. But he says things are finally changing here for the better. The problem is that it's coming at the hands of a man the U.S. describes as nothing short of a dictator — President Hugo Chávez. And Chávez doesn't seem to like Bush much either. In one public appearance, Chávez said, "George W. Bush: You are a donkey, Mr. Bush." His war of words with the Bush Administration is at times almost comical — but the Bush Administration isn't laughing. The U.S. said little when Chavez was briefly ousted in a coup in 2002, and ever since then Chaves has seen the U.S. as the invaders from the North. He's gone on an arms-buying spree — and recently began training as many as a half a million civilians as a military reserve. Guadalupe Rodriguez says she's already signed up. "The U.S. does whatever it fees like," she said through a translator. "We will not be caught unaware." Sounds extreme, but as Cowan and his team traveled through the country, they found Chávez is widely seen as the man leading Venezuela in a new direction — a Socialist one. And whatever the U.S. says about him – in Venezuela, there is plenty of popular support. 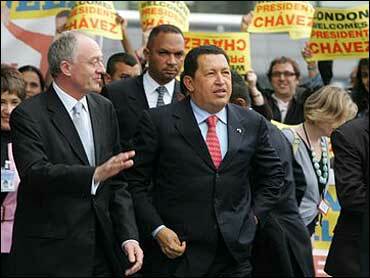 "If Chávez has any power at all, it's only because people feel that he's representing them," says Hardy. "I said to a woman on the street, 'Are you a follower of Chávez?' She says, 'No, he's following my ideas.'"